There was no exchange of personnel after all today. The plane to St Nord was cancelled because the weather was marginal. The forecast for tomorrow looks good though. The first team was ready to leave in the morning, but then the trip was cancelled. It has been somewhat windy and colder. This also meant that we could start drilling at 13.00. We continued till 22.30, and the processing continued till after midnight. We have reached 128m depth, and the ice contains much fewer melt layers indicating that we are in a cold period. It could be the so-called "Little Ice Age" between 1600 and 1870 AD. We had warmed-up leftovers for lunch. Claude prepared late-night food: Chinese egg-soup, rice, fried prawns and vegetables with nuts. The dessert was ice with strawberries (life is hard in the field :-)). Monday, 5. June. Ready to change crew. Here in camp we are now preparing for the replacement of crew which is planned to take place on Tuesday/Wednesday - if the weather allows it. According to the plan 7 persons will fly from Kangerlussuaq tomorrow noon with a Twin Otter. After 5 hours they will land at Konstabel Pynt (Scoresundby airport) and after another 5 hours they will hopefully land at Station Nord, which will be at midnight, due to the time difference between Station Nord and Kangerlussuaq of 2 hours. We will start driving the 6 persons who shall leave the camp for Station Nord, when we have received a message that the airplane has taken off. At Station Nord everybody will meet before the airplane departures to Kangerlussuaq again. Following, the new crew will be driven to the camp. Unfortunately, the weather forecast for tomorrow, Tuesday, says snow and wind at Station Nord (and therefore also here in camp) and if that happens, the flight will be postponed one day. Here in camp we are getting used to the highly variable weather, and we have learnt to listen seriously to weather forecast. Therefore, despite the nice weather at the moment, we are taking precautions. We have cleaned up in camp, removed all loose items and registered where everything is stored - and we have secured the tents. It is still high temperatures. The sun is shining from a clear sky and there has been no wind. The temperature again raised to 0 degrees C and the snow was wet and heavy. Again, it was to hot to be drilling the ice core, but this evening we experienced a small breeze and the temperature immediately fell down to -5 C. The drilling started at 6 pm and the work will continue until 3 am in the morning. We have now drilled more than 103 m.
Apart from this we have spent the day on building a new toilet, checking and preparing the skidoos, cleaning up in camp, digging out some plywood from a depth of 70 cm and finally, we have been looking for a pair of skis that disappeared in the snowstorm 2 weeks ago. They were found by putting a probe down into the snow, just like when looking for people that has been lost in an avalanche. The skis were buried one meter down in the snow. The generator was checked and we changed the oil and amongst our food boxes we found a lemming that was alive! There are thousands of lemmings around Station Nord. 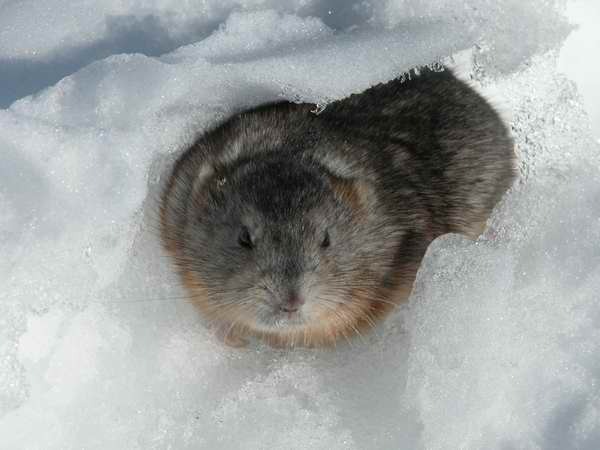 It is a rodent that behaves very much like a mole - but in snow. It digs pathways in the snow and during the winter it can easily eat of the vegetation that is covered in snow. If it is frightened it stands up and starts yapping. The people at Station Nord tells that a lemming was so insulted by having its pathway system destroyed by a 10 tons heavy snow blower that it actually attacked the snow blower, and now we are talking about an animal that is as big as a mouse, but without a tail and ears. The lemming has been the focus of a lot of discussions here. What is it doing here, on a 600 m thick glacier 20 km away from the margin? Some claims that it has run here, others think that it must have been a stowaway when Sverrir and Lars came back from Station Nord on Thursday. The Kansas people has finished packing. They have made a back-up of their data, so they are ready to leave Flade Isblink. We had re-heated leftovers for lunch. Simon cooked a night meal: Onion soup and beef with peas, sauce and mashed potatoes. It' s getting warm here. The sun shines from a clear sky and it heats. The air is completely quiet and at noon the temperature hit 0C. It is much too warm for the drilling. We decided to spend the day relaxing and doing minor chores in camp. A tent has been moved, as the floor began to sink because of the warmth. We don't want to drill at day time when it is so warm, so we decided to drill at night instead. We will probably have to move our "days" for some time in order to drill when it is cold (it is light all night anyway). At midnight the temperature was -4.5C and going down. The Kansas people finished their measurements today. They even managed to do an ekstra 12km line across the ridge so we can see whether there is a large accumulation difference on the north and south side. They are very happy to be finished two days before leaving. We installed another cooler in the drill tent, and we are making a new loo for the next team. Bruce cooked dinner: Chicken with pasta and tomato sauce. JP made a nigth meal: onion soup with Andreas' good bread.